It seems that the website published for the launch of OneCoin's ICO has been abandoned soon after getting it online. This screenshot was taken January 18 2018. Click to enlarge. Initially the coin offering was supposed to be carried out by Golden Gate Investments Ltd allegedly registered in Dubai. 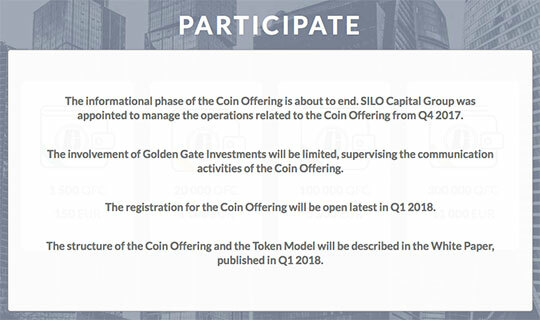 Not long after publishing the website SILO Capital Group Ltd was introduced to carry out the project instead of GGI Ltd, whose involvement would then be only "limited, supervising the communication activities of the Coin Offering." Neither of those companies can be found on Dubai's public company registry. As a conclusion I repeat that the website onecoinico.io seems to be abandoned soon after publishing it. Not even the terms of conditions have been updated to suit the change of company responsible for the coin offering. But still nothing about SILO Capital Group. Well, they do say that the registration for the Coin Offering will be open latest in Q1 2018. That gives time until the end of March. They don't actually say that the starting of the second stage on 17th means the registration starts.. So I think this article is a bit premature. "WHAT HAPPENS ON OCTOBER 25, 2017? The Coin Offering will start on October 25, 2017. There will be 4 rounds in all with start dates: 25 October 2017, 17 January 2018, 18 April 2018 and 11 July 2018. The closer to October 8, 2018 the less OFC will be offered with each package. Early participants will benefit most." And what's the purpose of the Roadmap then? To confuse people? Also, OneCoin doesn't call this ICO (Initial Coin Offering). They call it just "Coin Offering". Yes, you're right. I accidently typed it to the headline. Then again maybe it should be called "initial public coin offering". Not that this matters much, because they seem to have abandoned the whole idea. It was supposed to start in October 2017 when Ruja had already bagged her bags and left the ponzi scheme behind. This is really embarrassing for a scam of this scale. Even BunnyToken's ICO-scam looks more credible than the one of OneCoin. It's not like it would cost much money to update that website to misguide onecoiners with the ICO process and strengthen their beliefs. Thus it seems evident that the criminals running the show have pretty much lost their interest in OneCoin. Still nothing in the roadmap, only Oct 8 remaining before it’s a full failure. October 8 would be a perfect date to reboot the scam. I'm already waiting for an official announcement by the company: "There was some bad people in the management who deceived Ruja and that's why the launch of OneCoin was impossible. Due this unfortunate matter a new and even better coin will be set up and ICO of ZeroCoin will start very soon. ZeroCoin has the same stupid hand sign so everyone associated can keep showing the familiar hand sign. Of course also new education packages will be launched through our new academy called N0Life Academy."